Cirque du Soleil is known for combining two famous circus traditions—acrobatic performances and the art of clowning. 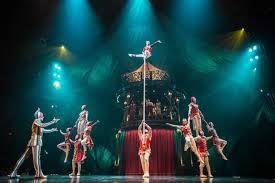 The show KOOZA exemplifies the original vision of Cirque established by Canadian Guy Laliberte in 1984. A street performer himself (accordionist, stilt-walker, and fire-eater), Laliberte recognized and cultivated talents that he observed from other street performers. As a result many creative productions have entertained millions of people all over the world for more than 30 years. Mime is a primary means of communication, as language becomes superfluous in the jaw-dropping acts that are hallmarks of Cirque shows. “People will be amazed that this show, first developed in 2007, looks brand new,” says artistic director Ron Kellum, a seasoned director, performer, and choreographer with experience directing a variety of shows. Costumes have been updated and backup acts added, Kellum says. A Texas native who danced on Broadway and produced numerous NFL halftime shows, he has succeeded in maintaining a fantastic, high quality show. The Trickster is quick and agile, a genius who knows all about the world of KOOZA because he created it. He appears and disappears at will, teases The Innocent, and plays tricks on him—all the while watching out for him. The King (of fools) tries to gain the respect of those who are crazier than himself. Two Court Clowns are The King’s humorous sidekicks. Other characters are the strange Heimloss, who is in charge of the mechanical machinery in the world of KOOZA, and The Dog, a nutty but loveable companion. 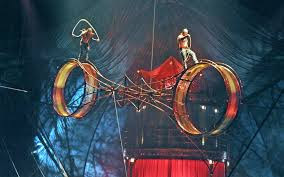 As expected with Cirque shows, performers provide extraordinary feats of athleticism. “The artists are so specialized in what they do—they are the best in the world,” Kellum says. Balancing upside down on a tower of chairs requires extreme muscle control. Spectators gasp as bodies are flung from teeterboards into the air, and complete multiple flips before landing upright. One of the most amazing acts involved stilts (I'll say no more). Contortionists and the hoops act display fluid movements and exceptional balance. Twin high wires that criss-cross diagonally high above the stage provide another challenging venue for four performers. Expect to be thrilled and delighted by tricks on the flying trapeze and unicycle stunts. Adrenalin will kick in when watching KOOZA’s 1,600-pound Wheel of Death rotate at heart-stopping speeds while performers execute perfect team work.